What does the term "Big Slick" mean in poker? What is the definition of the term "Big Slick"? 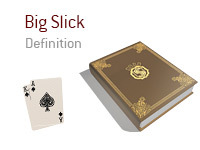 In poker, "Big Slick" is the name that is given to the hand Ace-King. Ace-King suited (for instance, Ah-Kh) is the fifth best starting hand in poker (behind AA, KK, QQ and JJ), while A-K unsuited (for instance, Ah-Ks) is the 8th best starting hand. You are playing in a $1/$2 NLHE cash game at your local casino. You are on the button. Action folds around to you, and you look down at a pair of Nines. You raise it 3x. 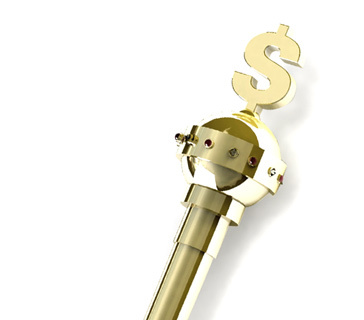 The SB folds, while the BB re-raises you after a bit of thought. You make the call. The flop comes down 3h-4h-7s, which is a pretty good flop for your hand. The BB checks, you bet and he calls. The turn brings the 3s. The BB checks again, you bet and he calls. You are almost certain that the big blind has something like A-K ("Big Slick") or A-Q. The river brings the Ah. You certainly did not want to see an Ace dealt on the river. The BB leads out with a small 1/4 pot bet, and you reluctantly make the call. He turns over As-Ks - aka "Big Slick" - and takes down the pot.